Overcoming UK industry’s much-bemoaned productivity gap by tapping into the potential of automation is widely seen as vital to the future success of the sector. And machine tool maker Yamazaki Mazak claims to have the perfect solution for manufacturers of all shapes and sizes on display at this week’s MACH exhibition. “We’ve got 13 machines on the stand covering the whole plethora of Mazak designs and solutions we can offer,” explained Alan Mucklow, the firm’s director for UK and Ireland. Mucklow highlighted a number of key exhibits amongst the portfolio machine tool and laser cutting machines on the company’s huge stand (Hall 20 – 760 – 790) including the HCR-5000S a five-axis horizontal machining centre specifically developed for high-speed 5-axis aluminium cutting. “This is very much focussed on aerospace, so high metal removal rates for aluminium, where removing the swarf as quickly as possible is the key objective so you don’t get the thermal impact,” he explained. The company’s stand also features a number of solutions developed here in the UK including the VTC-800 series – a five axis vertical machine centre suited for both aerospace applications and general subcontract manufacturing. Another highlight is the new UK-manufactured QUICK TURN 250MY and TA-12L a ‘plug and play’ turning centre and robotic machine tending solution which, said Mucklow, represents an affordable means of automating turning and milling centres. 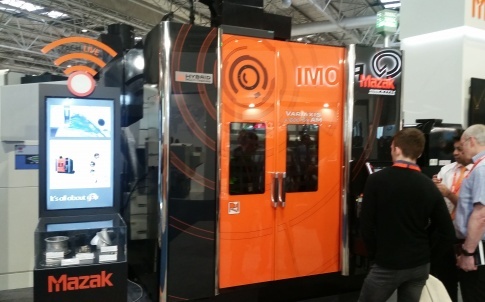 Mazak’s hybrid solutions – machines that combine subtractive and additive operations – are also on show. One notable exhibit, said Mucklow, is the Variaxis J600 AM. This incorporates a standard wire arc-welding head mounted on the machine’s headstock to deposit material layer by layer and grow near-net-shape 3D forms. Unsurprisingly, as with many of the other major exhibitors at this year’s event, automation is a key theme and the firm is showcasing its iSMART Factory suite of Industry 4.0 solutions, which were unveiled at EMO earlier this year.